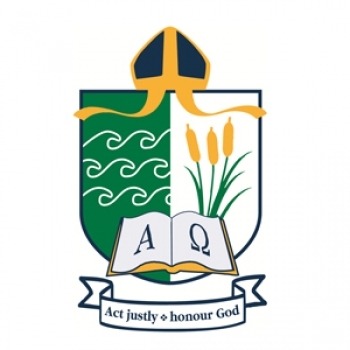 The Bishop’s Mitre shows the connection between the School and the Anglican Church. The Bishop has authority over the School, so the Bishop’s Mitre sits at the top. The Shield contains several important symbols. The waves of the left panel indicate the geographic position of the School near the ocean. They also represent one of the meanings of the word ‘mindarie’, which is ‘place of green water’. The right panel contains three rushes/grass tree stems. This symbol has several meanings. It represents another meaning of the word ‘mindarie’, which is ‘dry leaves from a grass tree’. It also creates a link to the family name of Peter Moyes. ‘Moyes’ is Old French for the Hebrew word ‘Moses’. Moses as a young boy was hidden from the Egyptian Pharaoh’s men in the bulrushes by the edge of the river Nile. The open book represents the Bible, the text that contains the teachings and truths upon which our Christian faith and Anglican tradition are founded. In Revelation 1:8, God identified himself as the "Alpha and Omega," the one “who is, and who was, and who is to come, the Almighty.” The Alpha and Omega are the first and last letters of the Greek alphabet. These were therefore used as early Christian symbols signifying that God is "the beginning and the end," meaning that God is eternal and that we look forward to His return. The motto, ‘Act justly, honour God’ directly refers to two important parts of life. The first phrase, ‘Act justly’, sets a high ideal for all to aspire to in life, treating all as we would like to be treated. ‘Honour God’, the second phrase, indicates the spiritual aspect of life that is important in order to lead a full and rich existence. To ‘Act justly’ and to ‘honour God’ require us to acquire the skills and knowledge necessary to be able to act in this manner. Learning to acquire the attitudes, skills and knowledge to be able to ‘Act justly, honour God’ is our aim.